What Will My Radiesse Treatment Cost? Your treatment with Radiesse may cost a bit more than a treatment with other HA fillers like Restylane and Juvederm. There are a couple of reasons for this. First, Radiesse is a longer lasting filler than the HA fillers. It helps you make your own collagen, which helps with its longer lasting effect. This is totally different from the HA fillers. Second, Radiesse comes in two different sizes: 0.8cc and 1.5cc. The HA fillers come in 1cc syringes only, so you get more product with Radiesse than you do with HA fillers. In Los Angeles and Orange County, the cost of a 1.5cc syringe of Radiesse ranges from $450 to $800. The average cost is around $650. Always keep in mind that the cost of Radiesse at Celibre Medical not only includes the cost of the product, but also the skill of our highly qualified injectors. Radiesse is a special dermal filler that can create dramatic change, but it needs to be injected by someone who has a deep and detailed understanding of how much to use and where to put it. You also want an expert injector with the experience necessary to avoid leaving you with more bruising and swelling which means more downtime. At Celibre Medical Corporation, our injectors set the bar when it comes to Radiesse injections. Please give us a call today! We can help you get started with a Radiesse treatment plan that’s customized for your specific needs, goals and budget. 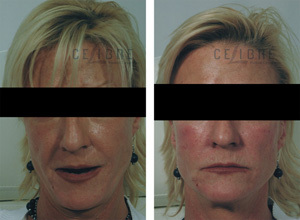 Visit our radiesse injections before and after pictures and see the results that were achieved for other patients. Contact Celibre today for your radiesse injection treatment!